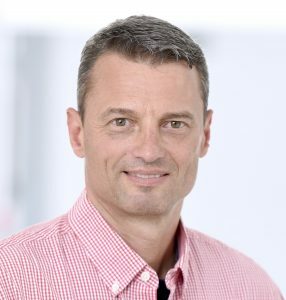 Andreas Hierlemann is Full Professor in the Department of Biosystems Science and Engineering (BSSE), ETH Zurich, Basel. He will be giving a colloquium at The Institut Català de Nanociència i Nanotecnologia (ICN2) on March 4th, 2019 at 11:45 hrs, as part of the BIST Colloquium Series. As one of the examples a HD-MEA system featuring a sensing area of 3.85 × 2.10 mm2 hosting 26’400 electrodes of 7 µm diameter at a center-to-center pitch of 17.5 µm will be shown.3,5 The switch matrix allows for simultaneously routing user-configurable selections of electrodes to 1024 recording channels and 32 stimulation units at the array periphery. With this system we were able to record subcellular-resolution data in various preparations. Applications include research in neural diseases and pharmacology. (1) Berdondini, L., et al. Lab on a Chip 2009, 9, 2644-2651. (2) Bertotti, G., et al. In Biomedical Circuits and Systems Conference (BioCAS), 2014 IEEE, 2014, pp 304-307. (3) Ballini, M., et al. IEEE J Solid-State Circuits 2014, 49, 2705-2719. (4) Eversmann, B., et al. IEEE J Solid-State Circuits 2003, 38, 2306-2317. (5) Müller, J., et al. Lab Chip 2015, 15, 2767-2780. Biography: Andreas Hierlemann completed his college education in chemistry at the University of Tübingen, Germany, and was awarded a Ph.D. degree in 1996. He then held Postdoctoral positions at Texas A & M University, College Station, TX, USA, in 1997, and at Sandia National Laboratories, Albuquerque, NM, USA, in 1998. In 1999, he joined the Department of Physics, ETH Zurich, Switzerland, where he was appointed Associate Professor in June 2004. In April 2008, he became a Full Professor in the Department of Biosystems Science and Engineering (BSSE), ETH Zurich, Basel. His research interests include the development and application of microsensor, microfluidic, and microelectronic technologies to address questions in biology and medicine with applications in the fields of systems biology, drug testing, personalized medicine, and neuroscience. For details, see https://www.bsse.ethz.ch/bel/.